9. Read the "Special Instructions for candidates admitted to the examination" given in "Rules for the Examination" Published in the Employment News and "Poster containing instructions displayed outside the Examination Hall". 15. Candidates who do not have clear photographs on the e-admit card/signatures on the Scannable Attendance Lists will have to bring a photo identity proof viz. 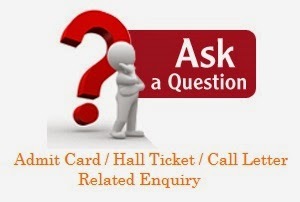 Adhar Card, Driving Licence, Passport,Voter I Card etc. and two passport size photographs one for each session for appearing in the examination with an undertaking.